Most of the time, brides-and-grooms-to-be choose their wedding date based on what would be convenient for themselves, family, and friends. They will also make such a decision based on the typical weather in their area (or in the area where the wedding will be held) in the given season. This, though, generally means that the honeymoon is a secondary thought. There are many popular honeymoon destinations, but you may find that you don’t enjoy the gorgeous location quite as much if the weather is too hot, too cold, too rainy, or the area is suffering storms during your stay. If you are looking for some fun in the sun after your faux-fur-and-fairy-gown Lake Tahoe wedding, then you will definitely want to choose a location in the opposite hemisphere (or, at least, close to the equator). While its snowing and blowing in the norther reaches of California, Australians are enjoying the height of summer. If you’ve always wanted to take a trip to the outback, this is the perfect time to do so. Some other locales to consider are Egypt, Hawaii, Ecuador, Morocco, or Mexico. If, on the other hand, you are looking for a great ski honeymoon, then stick around the area, head on over to Colorado, or drive up to Canada. You won’t have to go far to find some fresh powder. In April, May and June, the weather is growing more temperate in most areas north of the equator. If, after the long winter, you are ready for a sit in the sand, then check out Fiji, the Caribbean, Thailand, or Spain. If you want to hunt down the last remnants of Jack Frost’s touch, then head on North to Canada, Greenland, or Alaska. This isn’t the best time to hit the southern states for a vacation. You are apt to spend more time sweating than sipping champagne. However, it is a great time to travel around Europe – from the coasts of Spain to the Eiffel Tower, from the lush green foliage of Ireland to the city life in Germany and Austria, there are so many locations worth visiting in the European nation. With the weather getting cooler again, this is a great time to check out those white sand beaches and crystal waters of Bermuda, French Polynesia, Seychelles, or Bali. 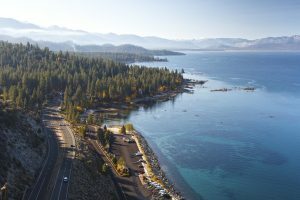 Enjoy the beautiful backdrop of fall foliage in Lake Tahoe before taking a dip in the warm waters in one of these tropical paradises.